Please read the full text before buying and note the using steps of the hooks. 1.Do not over bearing range. 2.Do not hang valuable and fragile items. 3.Do not stick on the surface of water, dust, oil, or wax. ceramic tile with pattern, wallpaper, wooden surface etc. Widely Use in kitchen, bathroom, living room, hallway, and office etc. The hooks can be used to hang up towel, razor, bath brushes, kitchen ware, key chain etc. Make your things tidy and save more space by using our hooks. 1.Clean the surface and keep the surface dry before use. (Please be sure the surface is smooth surface). 2.Peel off the cover. (NOTE: Do not touches the adhesive surface by hand). 3.Press the basic of the hook and touch steady from middle to edge. 4.Make sure the basic of the hook contact with the wall totally. Squeeze air out totally. Make sure vacuum. There is lifetime warranty and 24 hours friendly customer serviceon on Nikolable hooks. If you have any questions, please contact us at any time through Nikolable_service@outlook.com. Size and Package Information: 20* 2pack suction hooks. You will get 40 hooks hanger total. More suitable for business buyer. More cost-efficient. Hooks diameter--2.75in ; Height -- 4.35in. Super heavy duty, work well on most smooth surface. 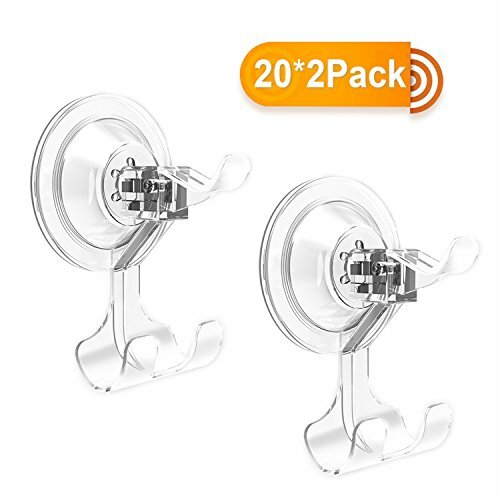 Durable and Grab Firmly: Transparent PET suction cup hook, by using suction vacuum design makes the hooks can hold a maximum load up to 6.6 pounds/ 6 kg. Easy Remove & Damage Free: No drilling, no screws, no tools. Just peel off the cover from the bulge, and put the hook on smooth surface. Traceless! No glue mark! No worry to damage the surface. Widely Use: Great for hanging Christmas wreaths and other decorations on windows, mirrors, suitable for kitchen, office, bathroom and other places to hang up towel, razor, bath brushes, kitchen ware, key chain etc. If you have any questions about this product by Nikolable, contact us by completing and submitting the form below. If you are looking for a specif part number, please include it with your message.